It's the first Saturday of February, and I'm here to spread some puppy love with all of you! First though, if you haven't seen the new release hop on over to yesterday's blog post and run through the gorgeous samples the design team shared, links are provided! get an additional 10% off your order using code TJ10Janelle! Now that's a lot of savings! My card today is a mix of old and new. I have had the adorable Doxie Guilt Trip stamp for a bit now and just needed a perfect sentiment to go with it. When this months release was revealed to the team, I found one that I think fits the attitude of the doxie face. There are new stamps this month with dogs, too! Let's see how I put this card together! Notice in the list of supplies that there are some shimmering products to go along with the sentiment too! It's a great match of stamps and accessories! Fold a 5-1/2 x 8-1/2 inch kraft cardstock in half for card base. Lay down stencil over the front of the folded card base and dab Nuvo mousse into stencil design. Set aside. 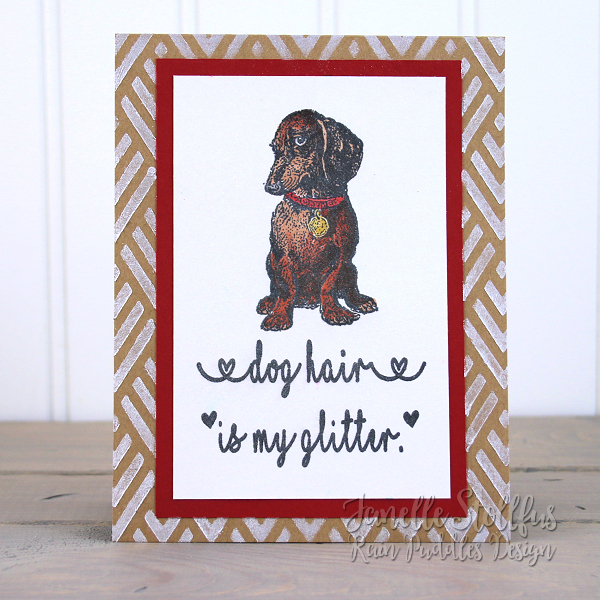 Lightly spray colored image with Shimmering Bliss Spray and frame with red cardstock. Glue onto the card base. That's all from me today! Have a great weekend and sending wishes to you for some creative time! Remember all the discounts mentioned above. 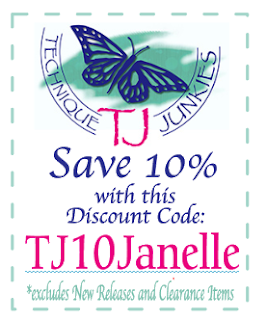 TJ10Janelle is entered during checkout in the code field! See more Technique Junkies projects by me on my Rain Puddles Design blog!